Tag Archive | "Mark Taber"
L.Cpl. Mark Taber Jr., of Cedar Springs, is currently deployed with the 3/7 Weapons Company in Afghanistan. 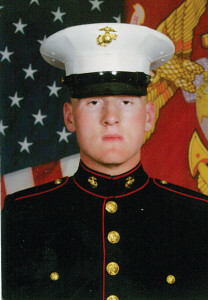 But as a U.S. Marine, his life is currently consumed with the defense of his country. After going through Boot Camp in San Diego, California, he went on to graduate from the School of Infantry in San Diego and Camp Pendleton, California. He then took Arabic language classes (Pashto) at San Diego State University for use on duty in Afghanistan. Mark is qualified as a 240 Gunner, and the vehicle mounted full auto 40 MM grenade launcher, and is currently positioned as the .50 Cal. Gunner in the turret of a MATV (the HUMV’s big brother). Mark has been given the privilege of being his platoon’s prayer leader both in California and Afghanistan. Mark is the son of Linda Taber and Mark Taber Sr.